I’d been fascinated with the Tatshenshini River in Alaska ever since I read about it in a National Geographic Magazine years ago. Taking a raft down it is one of those world-class, once in a lifetime trips, like a safari in Africa, or climbing in the Himalayas. It flows 250 miles through the Yukon Territories, British Columbia and finally Alaska before reaching salt water among the fjords and glaciers of Alaska’s fabled Inside Passage. It flows through the largest area of wilderness in the world. 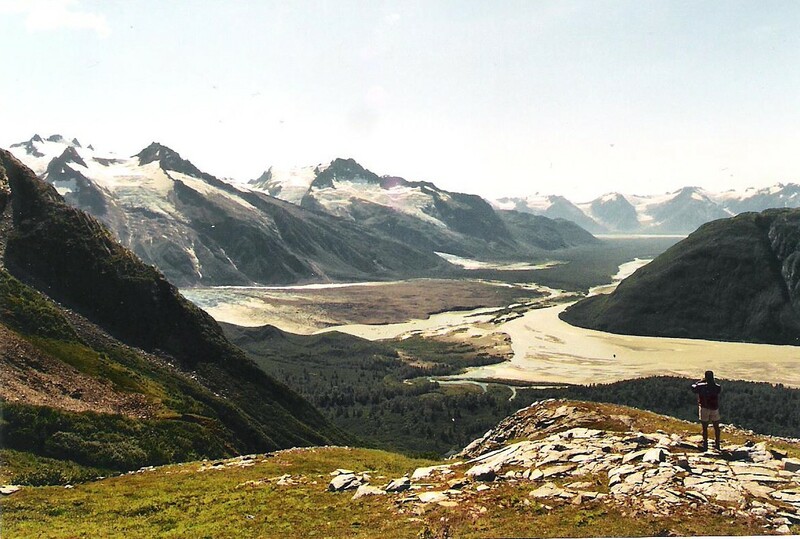 There’s no cell phone service, no airplanes overhead, no towns, no roads – just endless forests, glaciated mountains, bears, moose, and wolves. I investigated every way possible to explore this wilderness river on my own, but unable to find a partner and finding the logistics overwhelming, I decided to take a guided trip, something I never do. I signed up with Wilderness River Outfitters based in Idaho, but specialists in running the Tatshenshini. It was expensive, but one of the best decisions I’ve made in a long, long time. The trip lasted eleven days in late August covering 140 miles of river. The outfitters provided all food, tents, camping gear, life jackets and the rafts of course – clients bring their toiletries and clothes. Clients were responsible for getting to the meet-up point in the small coastal town of Haines, Alaska. Having lived in Southeast Alaska before, I knew that even in August it can get rainy and cold so I booked a flight into Juneau two days early knowing I could catch the Alaska Marine Highway ferry to Haines if the weather prevented flying. As it turned out it was sunny and warm in Juneau when I arrived, so I immediately flew to Haines in single-engine float plane. That got me to Haines two days before the trip was to start so I went directly to the Halsingland Hotel, part of WWI Fort Seward now converted into a vintage B&B. I spent the next two days renting a bicycle and peddling up the Chilkoot River where the late summer salmon run had attracted fishermen and eagles. 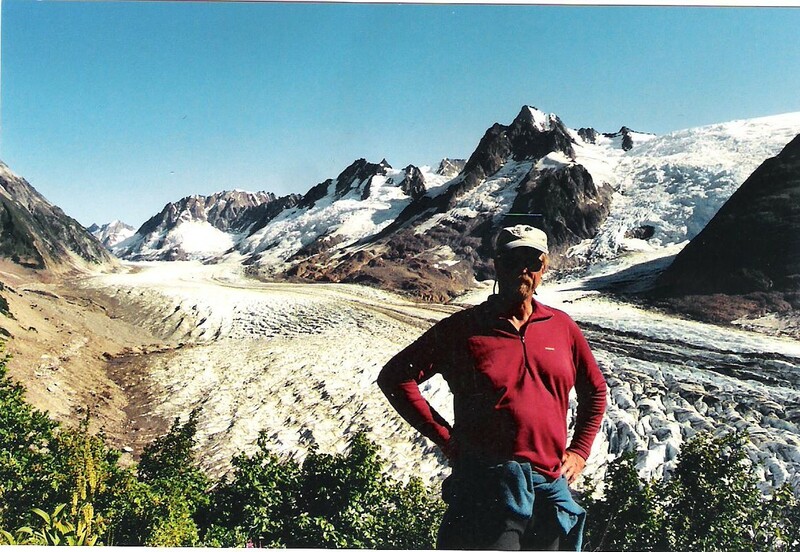 I chewed the fat with the locals at the Fogcutter Bar, toured through shops of local Chilkoot Indian art, ate great organic food at the Fireweed Restaurant, and met up with other trip members in the Halsingland’s Officer’s Club. Ours was a large group; a family of five from Massachusetts (mom, dad, uncle and ten year old kids), a twenties-something couple from Barcelona Spain (brother and sister as it turned out), an American married to a Brit (won their trip in a lottery at the local tavern in Idaho), a single woman from Santa Monica, a middle-age guy from Ohio, and middle-age couple from L.A.
We had four rafts, one of them a paddle boat (where the clients do the paddling), one a cargo boat to haul all the gear, the other two were oar boats piloted by the guides. We had four guides; Brent leading the trip, Art a commercial fisherman from Juneau, Eddie from Idaho, and Jim the young but capable apprentice. We boarded an old school bus and drove out of town, through Canadian customs into the Yukon Territories, and finally took a side road to the river, all in all a ½ day journey. At the river’s edge we were all given one dry bag and instructed that anything that doesn’t fit in the bag can’t go. The guides instructed us on safety matters, paddling, and most importantly how to use the wilderness toilet system composed of a toilet seat mounted onto an army surplus ammunition box (not as nasty as it sounds). Finally, Brent produced a sturdy cloth bag and emphasizing that this was a wilderness trip, he requested that we put our wrist watches, cell phones or any other electronic or time-keeping device into the bag for safekeeping until the trip’s end. We all did and for the next ten days the concept of time slipped away from us. Day One: At first sight, I was shocked to see that the fabled Tatshenshini was just a swift moving mountain stream at this point, maybe 25 yards wide. We boarded our rafts and glided down the swift current immediately passing under eagle nests and spotting our first bear of the trip climbing up an embankment as we quietly floated by. We entered a narrow canyon with 20-foot high vertical walls and spent the next hour bouncing through the Class III rapids (these were the only rapids on the trip, but not the only dangers). We finished the first day by pulling over to a wide, sandy shore and as the guides set up the cook stoves, and the other clients selected their tent sites, I strolled to the lower end of our sand spit, mug of coffee in hand. By August, sunset occurs around 9:00 along theTatshenshini and it was gathering dusk as I walked to the end of our sand spit. I snuck quietly into a clump of low trees and learned my first lesson of the trip; never leave camp without your camera. Across a narrow river channel was a small island with a drift log on its bank. Two bald eagles were perched on the log patiently watching a large grey wolf tearing at an animal carcass below them. I watched for five minutes until the wolf caught my scent and immediately ran off into the forest. 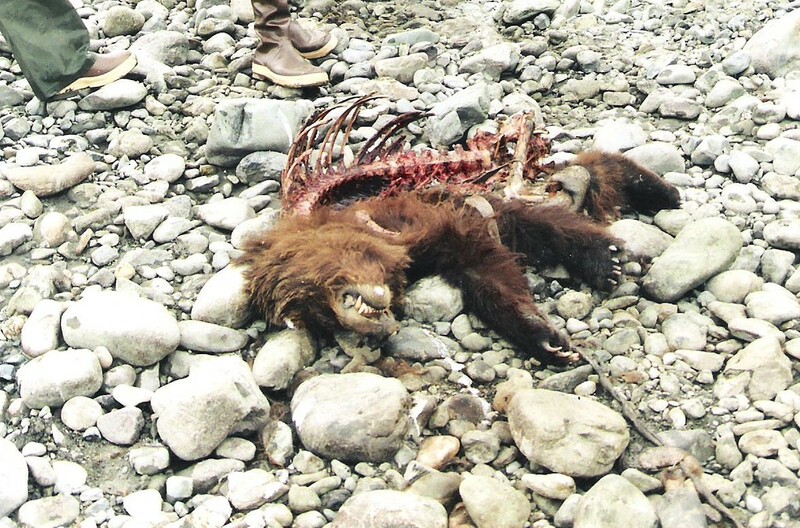 The next day we stopped at the island and found the carcass to be a small bear cub that had probably died upriver and washed up here on the shore. Day two: I immediately gravitated to the paddle boat with the Idahoans and the Spanish couple (paddling keeps you warm). We saw more black bears strolling along the river bank and eagles were becoming commonplace by now, barely attracting our attention. We stopped along the shoreline and loaded up a raft with bundles of firewood, an event that became a daily a routine. After a meal of T-bone steaks and salad (as many as you want) we sat around the campfire sipping whiskey, telling stories and reciting Robert Service poems before we turned in. Day three: Another sunny day on the river. More bears and more eagles. We stopped fairly early today as the guides had a treat for us; a day hike into the tundra in the mountains behind camp. We set up camp, put on our hiking boots, and followed Brent into the hills. After a strenuous grind up a forested pathway we broke out into a glorious mountain top of flower-studded grass and tundra; a scene out of the Sound of Music. An alpine glacier flowed below us and we surprised a large herd of mountain goats basking in a shallow depression just 30 feet away. Great day, but time to eat, so we ran all the way back to camp for a meal of fresh sockeye salmon that Art had brought with him from his commercial fishing boat. Day four: Today we stopped at a non-descript river bank with barely enough room to land the rafts. I wondered why we stopped at such a place as we followed Brent and Jim up a muddy ravine. Stopping for a break we noticed a large black bear following us. It approached within 20 yards of us and Brent reached for his bear spray but it turned away and disappeared through the brush before he had to use it. Keeping an eye out behind us, we continued on to a magnificent meadow overlooking the river. 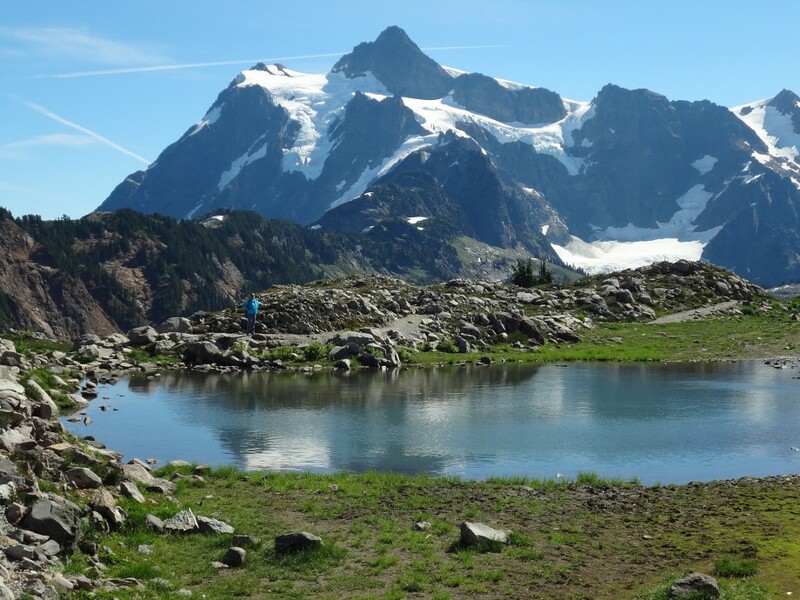 We could see huge glaciers winding down to the river and the mighty Fairweather Range of snow-capped peaks rising to 15,000 feet above the sea in the distance. As we lounged in the sun, picnicking and napping, I noticed something white moving around in a smaller meadow below us. It was a ghost bear and a big one too! Ghost bears are white-furred brown bears – not albinos – not polar bears, but a unique subspecies of brown bear found only in southeast Alaska. Even most Alaska natives haven’t seen one, but there he was and we watched him for an hour as he foraged in the brush. This was the top wildlife sighting of the trip and subject of much discussion as we bedded down for the night. Day five: Today we reached the confluence of the Alsek River with the Tatshenshini. 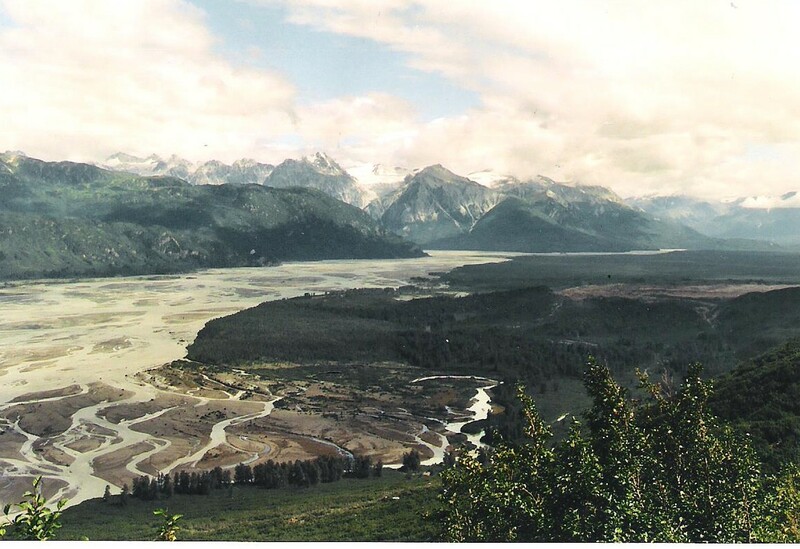 In fact, the Tatshenshini is considered a tributary to the Alsek and from here on the combined river is truly huge. We stopped at an island in the confluence of the rivers, hiking around it and finding indian petroglyphs carved into the rocks. We paddled up a small channel and saw hundreds of large salmon swimming in the clear waters beneath us. As we floated downstream the sheer size of the river struck us all silent. It was getting difficult to pick out the main channel from the braids of side channels, each one being big enough to be a river of its own. We made camp across from a mountain that shed large avalanches of rocks down its flanks throughout the day and night, a strange sight since its neighbors were quiet and stable. Day six: Today we reached one of the highlights of the trip; Walker Glacier. 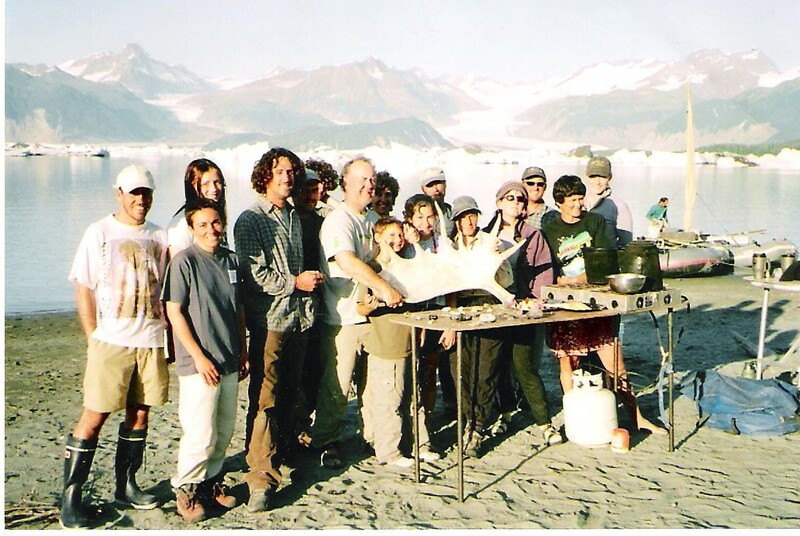 After a relaxing float and picking up our firewood we landed at the broad, sandy beach near the foot of Walker Glacier. As we unloaded the rafts and busied ourselves making camp we spotted a large brown bear walking across the flat apron of the glacier’s foot and up a steep embankment into the surrounding forest. A couple hours later two guides, the Spaniards and I climbed the same embankment to a viewpoint over the glacier. With bears in mind we loudly sang old Credence Clearwater Revival songs as we fought through the heavy brush, but our efforts were well rewarded as we broke out onto a promontory immediately over the massive river of ice, its surface rippled with deep blue crevasses. We returned to the foot of the glacier and joined the rest of the group exploring ice caves before sitting down to another excellent dinner. The guides set up a shower by forming a teepee of raft oars covered with a tarpaulin, heating five-gallon jugs of water, suspended them from the teepee poles, the water pouring through a shower head screwed into the water jug. Only enough water for the women, men can bathe in nearby ponds. As night fell we relaxed in our camp chair, full and freshly scrubbed, when suddenly a spectacular display of the aurora borealis broke out overhead – curtains of white light rippling across the sky. It doesn’t get much better than this. Days seven and eight: The river is truly massive now – easily ½ mile across and flowing strongly. The mountains through which the river has flowed have receded into the distance as we enter a huge, broad valley full of purple fireweed. There are massive glaciers feeding into the valley on both sides and we spot more bears, black and brown, strolling along the riverbank or climbing nearby hills. We find a large pond in a secluded depression and the Idaho couple and I strip off and dive into the freezing cold water. We don’t swim for long, but it refreshes us. More camps in gorgeous valleys, more stories and songs around the campfire, and we sadly realize we’re are reaching the end of the trip. Day nine: We float into enormous Alsek Lake. 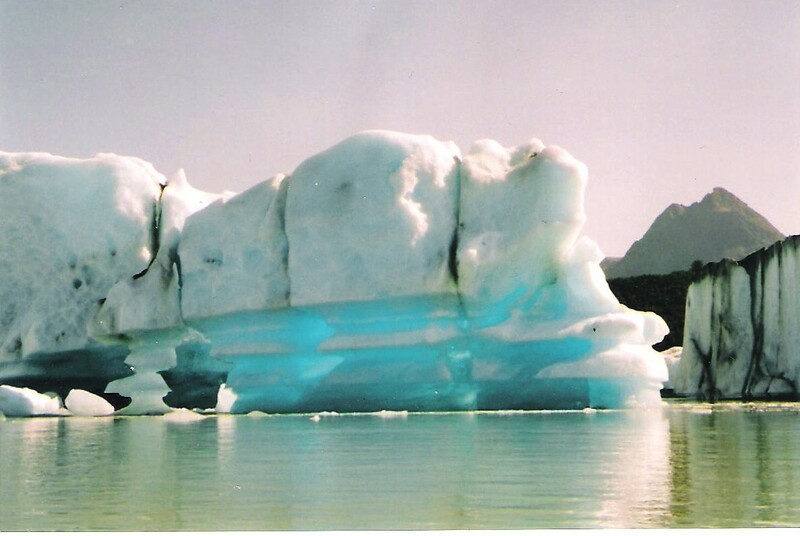 It’s filled with icebergs melted into fanciful shapes. At the opposite end of the lake we count seven massive glaciers flowing down the mountains into it. We lose the current of the river as we enter the placid lake waters and have to pull hard on the oars to make headway. We pass a camp occupied by the only other group of rafters we’ve seen on the entire trip and continue across the lake to a gently sloping beach topped by a flat, brushy area . We make camp and the guides pull the rafts far up onto the shore. I see why later when nearby icebergs suddenly roll over sending mini-tsunamis across the lake and washing up on our shore. A raft could be easily washed off shore from these waves. This happens with unnerving frequency, day and night and without warning. As night falls we do a group howl seeing if we can attract a response from any wolves in the area but instead receive a chorus of Oh Canada from the rafting party across the lake. We respond with Yankee Doodle Dandy and have a lively back and forth serenade until both sides tire of the game. The Idahoans and I walk a ¼ mile up the beach, strip off and swim in a small bay of the lake – polar bear skinny-dipping is becoming a tradition with us. Back to camp for dinner and tall tales around the campfire with the last of the whiskey and coffee. Day ten: We spend the day rowing around Alsek Lake. We approach the glaciers at the far side, but not too close since building-size chunks of ice can calve off into the lake without warning. As we turn back towards camp we watch a black bear swimming across the lake through the icebergs, cruising at an amazingly quick pace. Brent notices the wind is at our back, so we lash our two rafts together, rig oars as a mast, hoist a tarpaulin up on them, and voila – we’re sailing! This works pretty well until we round the point into our camp and lose the wind. We return the oars to their locks, separate the rafts, and have a lively rowing race for the last ½ mile into camp. Another fine meal, more stories, taunting the Canadians across the lake, and finally bedding down and thinking about tomorrow’s float into Dry Bay. Day Eleven: During breakfast we see the Canadians across the lake embarking down the river, still serenading us as they go. An hour later we’re right behind them. 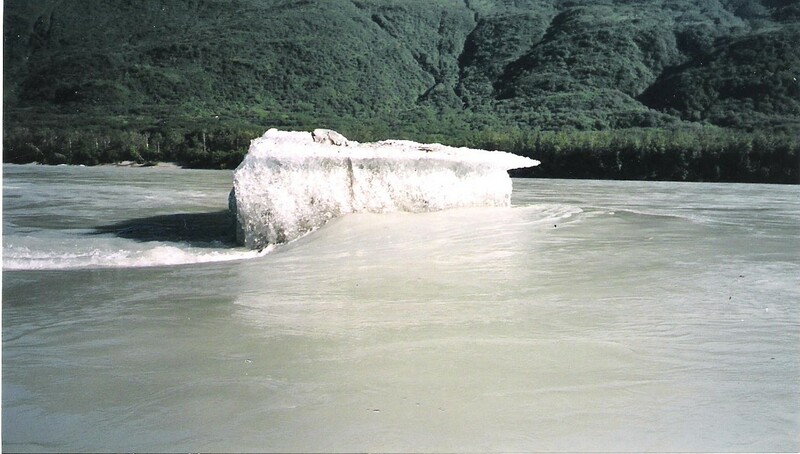 The Alsek River (as it’s now called) pours briskly out of the lake and as we pick up speed in the current we encounter huge icebergs that have grounded on the river bottom forming unexpected and dangerous obstacles. A boat can get sucked under them, or they can suddenly start moving again, or tip over without notice, so we give them a wide berth. We start seeing fishermen motoring up the river and by mid-day we arrive at Dry Bay, a small fishing village with an airstrip. We unload the rafts while apprentice Jim gets the odious task of emptying the now full ammunition cans. The rafts deflated, equipment cleaned, and gear neatly stowed we start getting ferried, two and three at a time, by single-engine float plane to Yakutat about an hour’s flight north from Dry Bay. Yakutat – civilization. The trip officially ends at Yakutat, a fishing village to the north that has a jetport. It was a clear, sunny day and as we flew in the floatplane from Dry Bay to Yakutat we could see the glaciated peaks of the Fairweather Range stretching far away into Wrangell-St Elias National Park with massive ice fields flowing through them. We’ve become a close-knit group, almost family-like and we exchange contact information as we sip cold beers in the small airport lounge. I may not see them again, but I’ll never forget the trip we shared. Like I said at the beginning, it was a spendy trip but one of the best decisions I ever made. As I board the Boeing 737 in Yakutat I’m already planning my return this time down the Tatshenini’s mother river, the wild Alsek.